Boliviana de Aviación, often referred to as simply BoA, is the flag carrier airline of the Plurinational State of Bolivia and is wholly owned by the country's government. It was established in October 2007 and began operations in March 2009. The airline is headquartered in Santa Cruz de la Sierra, with its main hub at Viru Viru International Airport and focus cities at El Alto International Airport and Jorge Wilstermann International Airport. Most international flights, however, including long-haul services to Madrid and Miami operate out of Viru Viru in Santa Cruz de la Sierra. Boliviana de Aviación currently flies to 13 destinations in 5 countries and is the largest airline in Bolivia in terms of fleet size and passengers carried. The airline was established as a state-owned enterprise in 2007 under the government of president Evo Morales as the successor airline of former flag carrier Lloyd Aéreo Boliviano (LAB), which ceased operations after 87 years of continuous operation and in 2011, following the demise of the country's second largest airline, AeroSur, Boliviana de Aviación expanded its network to international destinations and became the only major airline in Bolivia. In November 2014, the Boliviana de Aviación became a full member of the International Air Transport Association. BoA's first Boeing 737-300 parked at El Alto International Airport in La Paz. Boliviana de Aviación BoA was created by means of the Supreme Decree Nº 29318 of October 24, 2007 like a Strategic National Public enterprise, under the order of the Ministry of Public Works and the Ministry of Services and Housing. It is supported with articles of association approved by means of Supreme Decree Nº 29482 of March 19, 2008. The airline's principal intention is to provide the State a direct mechanism of execution of the aeronautical politics and the democratization of the air transport in Bolivia. It was established by the Bolivian Government under the president Evo Morales, replacing the troubled Lloyd Aéreo Boliviano as flag carrier. The president remembered that the state-owned airline was created to attend the country in emergency situations, like the bankruptctcy of the former flag carrier Lloyd Aéreo Boliviano (LAB), leaving hundreds of unemployed people. BoA's inaugural flight was made on 29 March 2009 connecting the cities of La Paz, Cochabamba and Santa Cruz de la Sierra. In 2010, BoA became the only airline in Bolivia to operate international flights outside Latin America after AeroSur ceased operations. Boliviana de Aviación (BoA) is currently undergoing a rapid expansion. In a little time, the airline received the title of flag carrier, along with AeroSur. This fact generated a strong competence among the two airlines. The main reason that generated BoA's success is the strong support and effort by the government. The Boeing 737-300 forms the core of the airline's fleet. In less than three months of operations (after its inaugural flight), Boliviana de Aviación extended its domestic network serving the city of Tarija. In a gradual time the airline expects to extend its services to the principal cities in Bolivia to consolidate its presence in the national market. The inaugural flight to Tarija was made from El Alto International Airport. Boliviana de Aviación operates a comprehensive network of scheduled domestic flights, covering all the principal cities of Bolivia. However the airline's fast growth allowed BoA to commence operating international routes. On 14 May 2010, Boliviana de Aviación received all the operative authorizations for flying internationally inaugurating its first international flight from Cochabamba to Buenos Aires. In November 2010, the airline inaugurated its second international destination: São Paulo. BoA currently offers six weekly frequencies to Buenos Aires and three trips to São Paulo, which will be extended to five frequencies. Boliviana de Aviación also plans to open new routes: Caracas (Venezuela), Havana (Cuba), Lima (Peru), Santo Domingo (Dominican Republic) and Miami (USA), Las Vegas (USA). Boliviana de Aviación started operations with only two Boeing 737-300s. On 29 September, BoA announced the arrival of its 3rd Boeing 737. On 14 April 2010, BoA received its 4th Boeing 737. In April 2011, BoA received its 5th Boeing 737, president Evo Morales celebrated the new acquisition and emphasized the positive results in the coverage of the internal market. The President anticipated that to consolidate this state company, like the biggest and youngest of Bolivia, this year Boliviana de Aviación will acquire a sixth airplane. On 29 March 2009, Boliviana of Aviación (Boa) made its inaugural flight. To almost a year of the fact, the participation of the state company in the regular aeronautical market came to a close of 50% and his utilities to some US$2.2 million. Some domestic networks have been dominated by the services of BoA. Most of the airline's financial success is due to the 10% reduction of all its fares in domestic flights compared with AeroSur. Boliviana de Aviación destinations as of January 2016. Year-round destinations, including seasonal and special flights are blue, future destinations are yellow. Boliviana de Aviación's main hub is in Cochabamba at Jorge Wilstermann International Airport. Its focus cities are La Paz and Santa Cruz de la Sierra. Most international flights, including long-haul services to Miami and Madrid operate out of Viru Viru International Airport due to the airport's capability to handle larger aircraft. A Boeing 737-300 at São Paulo–Guarulhos International Airport in 2012. A Boeing 767-300ER landing at Miami International Airport in 2016. Boeing 737-300 12 – 0 138 138 To be phased out. Replacement Aircraft: Boeing 737-700. Boeing 737-700 3 9 0 136 136 Entry into service: 2015-2016. Boeing 737-800 2 3 0 168 168 Entry into service: 2016. Bombardier CRJ200 2 — 0 50 50 To be operated as BoA Regional. A Boeing 767-200ER (now retired) landing at Madrid-Barajas Airport. The Bolivian Government and the Russian ambassador are negotiating the acquisition of the Antonov An-148 for official and civil uses. Bolivia is interested in acquiring 8 planes, one as the presidential carrier and 7 to the state-owned airlines which are Boliviana de Aviación and Transporte Aéreo Militar. According to the negotiation, BoA would receive 4 planes and TAM 3 planes of this type. However, the negotiation depends on the cooperative advances between the Bolivian and Russian governments as regards a credit for US$250 million. 1 2 3 4 "Memoria Anual 2014" (PDF) (in Spanish). Boliviana de Aviación. Archived from the original (PDF) on 16 March 2016. Retrieved 30 January 2016. ↑ "Bolivia's BoA Regional to launch in December". CH-Aviation. Retrieved 28 January 2016. ↑ "BoA ve nuevos destinos en La Habana y Lima". lostiempos.com. April 19, 2011. Archived from the original on 2015-04-02. Retrieved 2014-12-31. 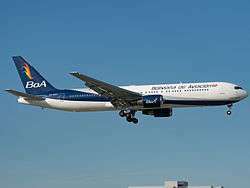 ↑ "Boliviana de Aviación eyes Caribbean flights this year.". CH-Aviation. Retrieved 28 January 2016. ↑ "IATA Current Airline Members". iata.org. 2015-03-03. Retrieved 2015-03-03. 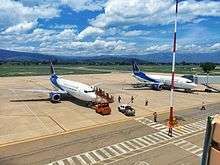 ↑ "Boliviana de Aviación, LIAT Airlines y Aerogal reciben certificación de IATA". eju.tv. 2014-11-04. Retrieved 2015-03-03. ↑ "BOA confirma inauguracion de ruta internacional a Buenos Aires | Tarija Bolivia Gas YPFB Nacionalizacion". Tarijalibre.tarijaindustrial.com. 2010-05-13. Retrieved 2013-02-03. ↑ "BoA inagura nuevo vuelo a São Paulo". Prensalibre.com. 2010-11-22. Retrieved 2013-02-03. ↑ "El gobierno entrega la quinta aeronave a BOA". Lostiempos.com. 2011-04-30. Retrieved 2013-02-03. ↑ Boliviana de Aviación Archived March 14, 2012, at the Wayback Machine. ↑ "BoA oferta sus tarifas rebajadas; AeroSur destaca su variada oferta | NOTAS DE AEROLINEAS DE BOLIVIA". Avionesbol.blogspot.com. March 28, 2009. Archived from the original on 2012-03-26. Retrieved 2013-02-03. ↑ "Boliviana de Aviación fleet details.". airfleets.net. Retrieved 28 January 2016. ↑ "Boliviana de Aviación (BoA) Fleet Details and History.". Planespotters.net. Retrieved 28 January 2016. ↑ "Boliviana de Aviación ahorrará US$500.000 con avión y tripulación propia". Retrieved 24 April 2015. ↑ "BoA incorpora un nuevo avión Boeing 737-800" (in Spanish). El Deber. Retrieved 17 November 2015. 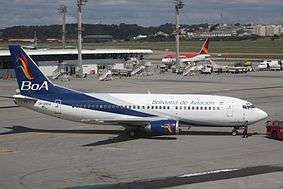 ↑ "BoA Boliviana de Aviación to add B737-800s by mid-summer". ch-aviation. Retrieved 24 April 2015. ↑ "Bolivia interesada en comprar avión presidencial y helicópteros rusos | Rusia-Iberoamérica | RIA Novosti". Sp.rian.ru. 2011-05-24. Retrieved 2013-02-03. ↑ "Compañía "Boliviana de Aviación" negocia cinco aviones rusos Antonov-148". Informeaeronautico.com. 2009-08-28. Retrieved 2013-02-03. Wikimedia Commons has media related to Boliviana de Aviación.